Wear a black mesh fit and flare dress for a ridiculously gorgeous look. Look at how well this ensemble is finished off with black suede pumps. If it's comfort and ease that you're looking for in an outfit, choose a burgundy ruffle shift dress. A pair of black suede pumps will integrate smoothly within a variety of looks. If you're searching for a casual yet totally chic ensemble, dress in a white and red print crew-neck sweater and black skinny pants. Both items are totally comfy and will look fabulous together. Elevate this look with Rockport total motion kalila pump from Nordstrom. If you're a fan of practicality dressing when it comes to your personal style, you'll love this chic combination of a blue denim jacket and a dark green embroidered maxi skirt. 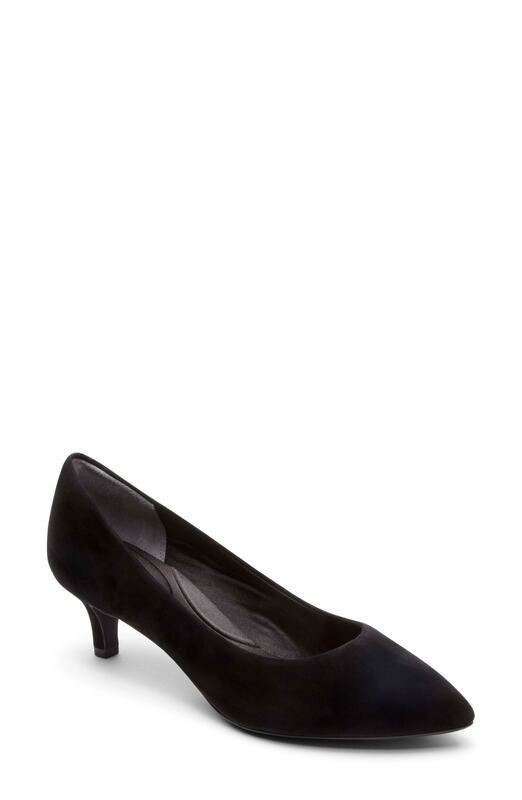 Rockport total motion kalila pump from Nordstrom will instantly smarten up even the laziest of looks. For a casual stylish ensemble, make a red tweed jacket and black leather skinny pants your outfit choice — these two items go really well together. When it comes to shoes, this outfit pairs nicely with black suede pumps. If you're in search of a casual yet stylish getup, try teaming a light blue blazer with a light blue skater skirt. Both items are totally comfy and will look fabulous together. Up the cool of your ensemble by completing it with Rockport total motion kalila pump. Choose a navy floral sheath dress to prove you've got serious styling prowess. Rockport total motion kalila pump complement this getup very well. If you're on a mission for a casual yet totally chic ensemble, try pairing a black lace long sleeve t-shirt with a black tulle full skirt. Both pieces are totally comfy and will look fabulous paired together. Up the cool of your ensemble by rounding it off with Rockport total motion kalila pump. If you're on a mission for a casual yet totally stylish look, team a blue denim jacket with black shorts. Both garments are totally comfy and will look fabulous together. Rocking a pair of Rockport total motion kalila pump is an easy way to add extra flair to your outfit.